Spray a 10" springform pan with non-stick cooking spray. In large bowl mix together cake mix, milk, butter and eggs until combined. Spread half of your cake mixture into bottom of prepared pan. Place pie facedown into pan so the bottom of the pie points up. Spread remaining cake batter on top of pie and spread out covering the whole thing. Bake for 1 hour and 15 minutes covering with tinfoil after about 45 minutes, until toothpick inserted in center comes out clean. 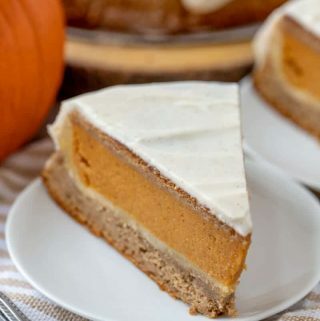 To make glaze whisk together your powdered sugar, pumpkin pie spice and heavy cream until you reach desired consistency and spread over cooled cake, cut and serve.